The back of the horse is not naturally created to carry a rider and saddle. Over the span of a lifetime, the back of a horse has a lot to bare. This is why it's important as riders who care, to take a closer look at the issue and review it from a physiological standpoint. Only correct training under a well-fitting saddle enables a horse to lift his back, and reach out far and powerfully underneath his center of gravity. This action allows the necessary muscles to form, which stabilize the columnar vertebrae - eventually turning the horse into a riding horse. The thoracic vertebrae are most stable between the withers and the 15th vertebrae. It is here that the horse can calibrate the weight of rider and saddle the best. Sabine Ullmann, a German equine physiotherapist, decided after working for years on horses with saddle related back problems, to use her knowledge to create her own range of high quality saddles. With that, she designed the Barefoot Saddles for the horse's comfort and to ensure a healthy back for the horse. All Barefoot Saddles are designed anatomically to follow the horse's topline, and are flexible in all dimensions - without a rigid tree . These treeless saddles adjust themselves according to the horse's back, and allow bigger strides out of the shoulder as well as lifting of the back. Columnar vertebrae, as well as withers, stay free of pressure. Additionally, under a Barefoot Saddle, the shoulder and the loin area aren't restricted. The Barefoot Saddle positions the rider into the perfect saddle area, between withers and the 15th vertebrae - thus aiding the horse in equilibrating his weight. The Barefoot Saddle allows a close contact feeling between horse and rider, making it ideally suited for beginners, natural horsemanship, and even riders with a handicap. The seat is comfortable and cushioned - ideal for a long ride. 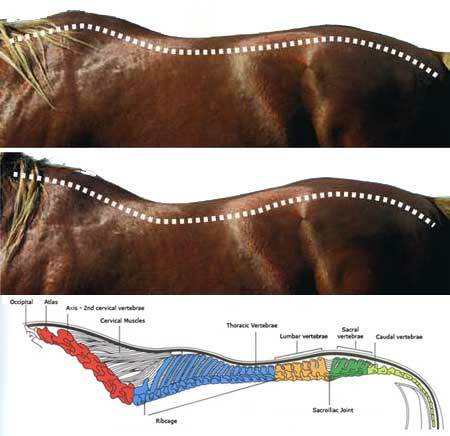 The rider's back is also made comfortable thanks to the soft and elastic way the horse's movements are transmitted. VPS stands for 'Vertebrae Protection System'. It consists of a combination of different materials, some more pressure distributing whilst others are more pressure absorbing. This includes sandwiching shock absorbing Elastomer layers and a pressure distributing Polymer layer . All materials are totally flexible, allowing the saddle to instantly adjust to the horse's movements and any changes to the horse's back. All materials have a smooth surface and beveled edges.Barefoot does not use upholstery material which could compress unevenly and create uneven pressure distribution. The VPS-System is not bulky and does not interfere with the rider's communication through the aids. VPS aids the best possible weight distribution in the area that can carry weight, between the withers and the 15/16 thoracic vertebrae. Pressure points are eliminated, as pressure readings prove. The soft panel construction to the left and right of the spine allow for a distinct spinal channel and provide spinal & wither clearance. The rider's weight is still distributed over the whole saddle area. Under a Barefoot Saddle a horse can move freely, arch and lift his back and allow a true sideways movement of the spine. The horse can bend without having to avoid the pressure of a tree on his back. The Barefoot is the most flexible saddle in the world. It can therefore adapt, anytime, to any changes of the horse's back. A horse's back mainly changes due to seasonal changes, training or age. 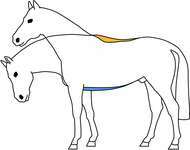 The back also changes shape (see illustration) during forward- upward movement when the horse lifts and stretches his back. A conventional saddle cannot keep up with the movement - it blocks at least part of the back muscles and therefore buildup of muscles is not possible and muscle atrophy is the end product. Under a Barefoot Saddle, a horse can let go, relax his muscles, stretch forward - upwards, without any pressure from above. The horse learns to move without pain, and that moving under a saddle can be fun! We have often noticed that horses increase their tempo, and the strides automatically become bigger. The horse suddenly offers what the rider has tried to achieve, month after month through training. How Can Treeless Saddles Work? Every horse's back is different. The back of the individual horse will change often during its lifetime through age, training, or seasonal transitions. Whenever we ride, the horse's back is constantly in motion. All Barefoot Saddles are designed anatomically to follow the horse's topline and they are flexible in all directions - without a rigid tree. They adjust themselves ideally according to the horse's back and allow freedom of the shoulder as well as lifting of the back. Columnar vertebrae as well as withers stay free of pressure; also the shoulder and the loin area aren't restricted. The Barefoot saddle positions the rider into the perfect saddle area, between the withers and 15th vertebrae, thus aiding the horse in carrying his weight. The horse should ideally not have any weight bearing beyond T14 but definitely no saddle should load the horse's loin area behind the last rib (T 18). The area on the horse's back that is equipped to carry us the most comfortably is between the 9th and 14th thoracic vertebrae. This area is in fact a lot smaller than most of us think. This is particularly true if you own a horse that is short in the back. The further we move away from the horse's center of gravity the more likely it is that soundness problems will occur. The Barefoot Saddle wraps the rider's weight around the horse's center of gravity. If you look at your buttocks and upper thighs and compare the size of that area with the panels of a treed saddle you might find that the treeless rider actually distributes his/her weight over a larger area than the rider in a conventional saddle. For rounder, flatter shaped horses, we always recommend an English rigging system over western rigging, as it provides additional hold, and a saddle pad that helps with saddle slip like the Barefoot Physio Saddle Pads. We always recommend a short girth or cinch. The shorter the girth/cinch the more secure the saddle will fit. We recommend that you girth snuggly, and re-tighten your girth after mounting. We recommend you use a mounting block or other mounting aids (i.e. tree stump, rock, etc.) when mounting your horse. It is better for your horse's back and lessens the strain placed on his back and withers. With some horses and treeless saddles, you will not be able to mount from the ground safely. After adjusting to the different feel of a treeless saddle, you may develop a new connection with your horse that gives both of you a more secure feel. A treeless saddle does not provide any more security than a treed saddle. The ideal girth position for a treeless saddle is shown in the picture to the right. 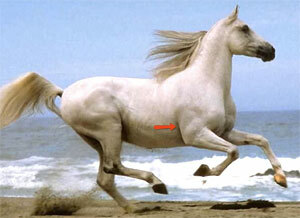 The arrow shows the position the girth should be when it is tightened - just above the elbow of the horse's front leg. This shorter style of girth/cinch results in a more secure saddle fit. To ensure you get the correct girth size, measure with a measuring tape from a hand width above the horse's elbow on one side, down under the belly, to a hand width above the elbow on the other side. Girth lengths are always given from the end of one buckle to the end of the other. This measuring method ensures that buckles lie far enough above the elbows. Click here for our printable measuring template, a Step-by-Step Guide to correct pommel width for your horse. Below is a chart with the measurements of each Barefoot Treeless Saddle (centimeters). Please note, *clothes size is represented in European sizing. Barefoot Saddles are handmade. Each saddle is unique - minor differences are possible. Most average horses do well with the same, standard, medium-wide fork. Weight changes from summer to winter are not a concern anymore, changes in shape from muscling up during training don't require a new saddle, blanket or stuffing. If you get a new horse you can start riding right away, with confidence, and don't have to pay for professional saddle fitting, alterations, a new saddle, or go through weeks of painful trial and error. Maybe. Try to use a mounting block, a rock, log, truck, fence, ditch, bank, or just a handy slope in the terrain to assist you in mounting - your horse will love you for it! Choosing a non-slip Barefoot Physio Saddle Pad and non-slip girth or cinch will help. For short-legged riders and very tall or round horses with no withers, there are mounting aids available. These are straps that go around the opposite foreleg, you put them on, mount, then unclip it from the saddle and park it in its keeper buckle. There are also mounting stools that fold up and go into a small carrying bag and attach to your saddle. It depends on your old saddle and style of riding. Try out your new Barefoot Saddle in a safe enclosed area. Most likely you'll just be blown away by the comfortable seat, by the big swing in your horse's back and gaits, and by how easily your horse seems to read your aids and cues now. If you had an English saddle before, and have a wide-backed horse, you may feel you're sitting wider in a treeless. This is because now you feel the width of the horse's actual back, when before you were sitting on top of a built-up, narrow twist. The muscles around your hip joints or inner thighs may need to adjust to this, if you have become a bit inflexible. Stretching warm up exercises before riding my help. Any 'stretched wide' feeling should disappear after a few rides. If you have bad arthritis in your hip or other chronic hip problems, you can try to fix this by customizing your saddle by building up the middle of the seat with one or two layers of foam cut in a narrower shape and put under the seat. Put seat back on with Velcro. No. But you may need to get used to your new horse! Don't ask too much right away and ride in a safe enclosed area for the first couple of rides. Most horses are very happy to be finally able to move freely and without pain. This can lead to some exuberance on your first ride or two - be prepared for a more spirited horse! And any new saddle may feel just plain weird to a horse, plus the Barefoot allows it to feel what you're doing up there, which may be feel odd the first time, too. Absolutely! 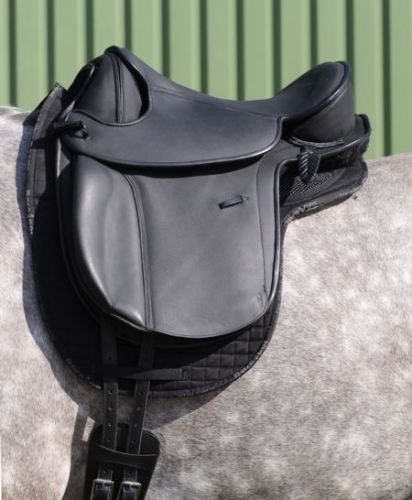 A Barefoot treeless saddle is suitable for starting and training young horses! Thanks to the total flexibility of the saddle, it can adjust to the horse's back while the horse changes shape through growth and training. A horse undergoing training goes through a pronounced transformation - the muscles get bigger, fat disappears, the back develops. The Barefoot saddle will 'grow' with the horse. The saddle is soft, comfy, deep and flexible, and your posterior will feel right at home in it. However, all those layers of foam and fleece will compress over time and mold somewhat to you and your horse. This may take a month or so, depending on how much you ride. During this time, you need to re-tighten the girth a lot, until everything has compressed and settled a bit. Absolutely! In fact, it is especially well suited for gaited horses: it allows their backs and shoulders the freedom to move and gait. No. It is solid, but contained in a zippered pocket, and the zippers will wear out if you put too much force on the horn. You can use it for stability when riding, or to hang a light horn bag from it, but don't tie any animals to it, and don't haul yourself up in the saddle from the ground on it. If you expect to do some roping, a treeless saddle is not for you! It is always best to consult the rule book of any particular competition. If you are a regular and ambitious jumper, treeless saddles are not for you. There is a lot of force put on the stirrup attachment when landing, and this is better caught by a stiff tree. If you canter over a cavellti or log on the trail now and then, it's not an issue. Generally speaking, yes, but there are exceptions. Riders that weigh 165-170 lbs and over can be successful in a treeless saddle depending on what horse they are riding. This 170 lbs thresh hold can be stretched with quality saddle pads and inserts, and the rider paired with a large enough horse to carry them with the back musculature to support them. I'M NOT SURE WHICH SIZE SADDLE TO ORDER. If you're in doubt, go with Size Two. It takes a fairly petite person to be comfortable in a Size One. With a treeless, you don't need to worry about pinching the shoulders - everything is soft and flexible. Most important is a saddle pad with inserts. It is an integral part of any treeless saddle system and plays a big role in its performance. With all treeless saddles, you should use a saddle pad with shock absorbing foam or felt inserts on either side of the spine, leaving the spine channel clear. The Arizona and Arizona Nut use a traditional western cinch. 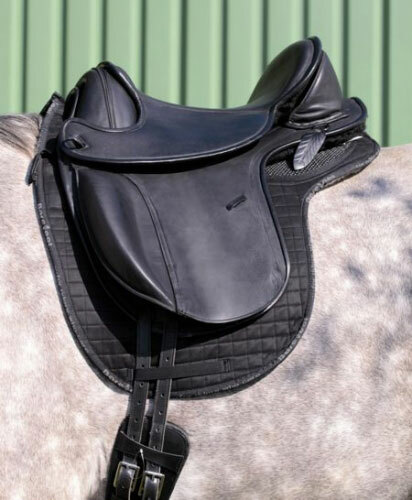 All other models need a short dressage style girth because the saddles are equipped with long billets. To figure out which size you will need, measure with a measuring tape from a hand width above the horse's elbow on one side, down under the belly, to a hand width above the elbow on the other side. Girth lengths are always given from the end of one buckle to the end of the other. This measuring method ensures that buckles lie far enough above the elbows. For the Western cinch, measure with a tape, from two hand widths above the horse's elbow on one side, down under the belly, to two hand widths above the elbow on the other side. This measuring method ensures that buckles lie far enough above the points of the elbows. Safety Stirrups are your safest choice, but it's the rider's choice. In a treeless saddle the stirrup leather or fender is fed through a solid ring, so will not slide out. There are various English safety stirrups, and cages for trail stirrups, and western tapaderos. These all prevent the foot from slipping through the stirrup. DO I NEED BAREFOOT STIRRUP LEATHERS? Not necessarily. You can use traditional English stirrup leathers, but the buckle needs to be put down by the ankle. Then tuck the loose end into a sleeve, or stirrup leather keeper. Do NOT use your stirrup leathers with the buckles under your thigh. It will not be comfortable. Easy: Nubuck leather doesn't need saddle soap, and don't use Neats' foot oil either - it often contains chemical thinners which may weaken and harden leather. Remove sweat and dirt with a damp rag. Use Barefoot Leather Cleaner with a soft cloth, spray on, let in soak it, and wipe off. Finish your leather care with Barefoot Leather Care Cream. Apply a small amount of cream with enclosed sponge. Allow leather to dry.